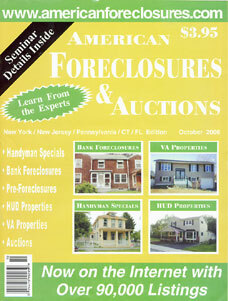 American Foreclosures & Auctions is a monthly magazine which lists pre-foreclosures for New Jersey and New York. In addition, bank and government owned properties in New Jersey, New York , Connecticut and Florida are listed. Moreover, the magazine provides information about "handyman specials," business opportunities and articles about buying, selling, renovating & financing investment properties. Why not have a copy of American Foreclosures delivered to your door each month for only $36.00 per year? You can also order a two or three year subscription at substantial savings.